Borders was closed today forever, but at least CEO Edwards has got already job offers..
Today is a sad day for book lovers - GalleyCat reported Borders will close forever today, leaving tens of thousands of booksellers out of work. One who is also out of work, but not worried too much about it is Borders' CEO Edwards. Edwards did an interview to the Detroit News, and according to the newspaper, "he is an unemployed chief executive without a grudge and with a $125,000 severance check.he doesn't know where he's headed — perhaps Southern California or Oregon, where he led Lucy Activewear and Ellington Leather — but he said he has received job offers from companies impressed with his handling of Borders' bankruptcy." I'm glad to hear that Edwards already has job offers, but I really couldn't understand how any company can be impressed with his handling the bankruptcy. 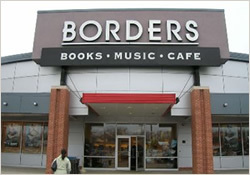 Borders got the worst outcome possible of this bankruptcy, so what's there to be impressed about exactly? Also another thing that bugged me on this interview is that Edwards doesn't take on himself any responsibility for what happened - "For most of its life, Borders enjoyed a reputation as the go-to destination for bookworms. But "you can be the best ice salesman in America until the refrigerator comes," Edwards said." That's it? That's the best you can say? How about 'I take responsibility on what happened'? Nothing even close to that.. Well, if this is the sort of leadership the companies offering him job are looking for then they found their right man! I still think at least his former employees deserve more than that.